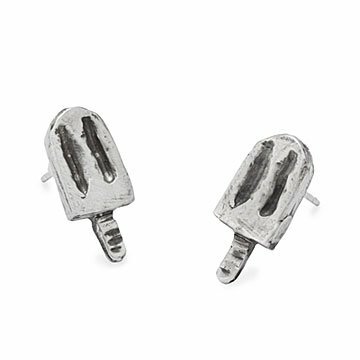 Inspired by a favorite icy treat, Rachel Pfeffer handcrafts these whimsical sterling silver studs. They may not play the ice cream truck tune of your youth (probably a good thing), but these popsicle earrings are sure to inspire cheerful childhood memories (or, let's be honest, last weekend). Rachel Pfeffer handcrafted sterling silver studs aren't going to cool you off, but they will bring a bit of summertime fun to your wardrobe, whatever the time of year. Handmade in Washington, D.C.